After a few days of tough talking, the Prime Minister has demonstrated that he is not much more than that – just talk. Addressing the National Assembly on Wednesday, Nawaz Sharif announced that after suffering unrelenting attacks and the Taliban’s repeated rejection of peace talks, the government was finally responding by…once again requesting talks. While Nawaz Sharif held out the begging bowl to Taliban, the Taliban responded by killing more Pakistanis in a series of bomb attacks. Taliban spokesmen have said that they will consider the offer of talks and left the Prime Minister to wait for a response. While Taliban apologists will point to this as a sign of success, there’s good reason to believe that they’re once again misguided. Just a few days ago Taliban explained that they understand the art of negotiation very well – much better, apparently, than Nawaz Sharif. The Taliban believes it is capable of fighting. Apparently the state does not. The Taliban will only approach negotiations from a position of strength. Apparently the state does not share the same standard. Let’s pretend that the Taliban accepts the government’s latest offer for talks. What should we expect from these negotiations? Any negotiation involves a give and take by both sides, so it is important to know what each side’s demands are. The government’s only demand is that Taliban lay down their arms and stop attacks. Otherwise…otherwise, what? The Prime Minister will annoy the Taliban shura to death with his incessant begging for a date? The Taliban are much more specific in their demands. They want to be allowed to re-write the constitution. True to their word, Taliban have not budged an inch. This is the same demand that they have made since long. “We are ready to cease fire with Pakistan as long as they meet our demands, that an Islamic system should be put into place, they should fix their foreign policy and stop agreeing to American’s demands,” [said Taliban spokesperson Ihsanullah Ihsan]. Is Nawaz Sharif prepared to meet this demand? 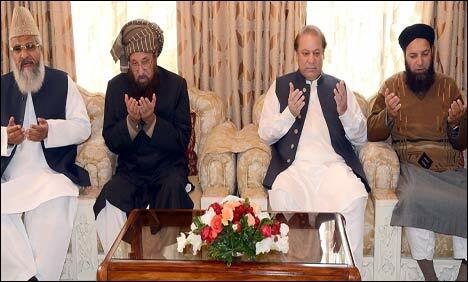 This entry was posted in Blogs and tagged Nawaz Sharif, peace talks, taliban by Mahmood Adeel. Bookmark the permalink.